"In “Slave to the Dream”, Shades Wright tells his gut wrenching, heart breaking, surprising, and inspiring life story. He skillfully brings the reader into his world and presents an intense, motivating story about how dreams can come true through years of dedication, persistence, and spiritual faith. Highly recommended!" The Columbia Review. “Slave to the Dream” by Shades Wright is a memoir of one man’s intense rebellion, roadblocks, and—ultimately—his inspiring growth, powered by the healing powers of family support and divine intervention. The book will appeal to readers who are interested in stories of overcoming chaos and desperation, achieving personal transformation, and the wisdom one gains from a life of trials and triumphs. 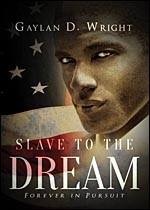 In “Slave to the Dream”, Shades Wright tells his gut wrenching, heart breaking, surprising, and inspiring life story. He skillfully brings the reader into his world and presents an intense, motivating story about how dreams can come true through years of dedication, persistence, and spiritual faith. Highly recommended!